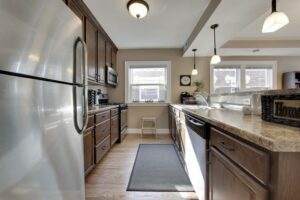 Titus Contracting is happy to share yet another story about an apartment renovation in Minneapolis! We recently helped with this apartment renovation at Columbus Point Apartments in Minneapolis. This two-bedroom, one-bathroom apartment was completely renovated and modernized. The building itself was built in the 1920s, so the building has still retained a lot of that old-fashioned charm, but the apartment is definitely contemporary. 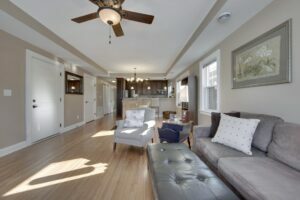 This was one of our more satisfying apartment renovation jobs simply because the building was able to retain its old-world charm while the apartment was updated. The kitchen, bathroom, bedrooms and floors were all refurbished with a more 2014 look and feel. We put in new windows and repainted the entire apartment too. You can tell this isn’t a building that was built 10 years ago! We love the detailed brickwork, especially along the top of the building and the windows. One of the best parts of this apartment is the kitchen. We love how it opens up so whoever is working in the kitchen can still interact with folks in the dining room area and living room. This is one of the bedrooms. We think it’s charming, and we love the soft gray color on the walls. 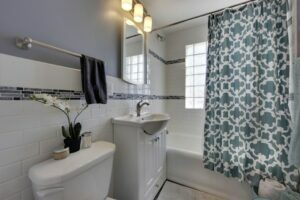 The bathroom is also painted a soft gray color, and the matching tile is a nice touch! This is the other bedroom, and, again, the soft gray paint on the wall gives it a very relaxing vibe and tone. Titus Contracting really excels at apartment renovation. We can take an old and outdated apartment (or the entire building) and completely redo the whole thing. From the floors to the walls to the ceilings and everything in between, we are your one-stop-shop for all things apartment renovation. 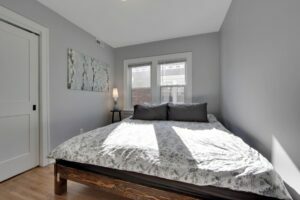 So when you’re ready to look into apartment renovation in Minneapolis, call us at 952-746-7817 or contact us for a Free Estimate.